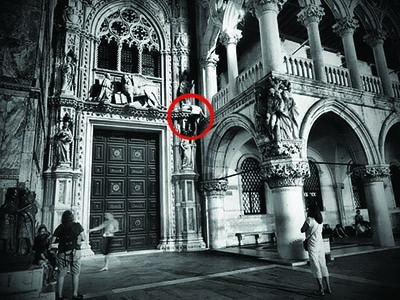 This week in Venice, a young man decided to climb the Palazzo Ducale (the Doges Palace) exactly at the Porta della Carta (the doors to the left shown here). His friends made pictures and it landed on facebook in less time than it took him to climb.While it seemed a random act of vandalism, it turns out his aspirations were instilled by a video game. 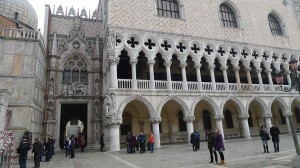 The Palazzo Ducale (Doges Palace) as a seat of government dates back to 810ad when the Doge Angelo Partecipazio moved from Malamocco (Lido) to Rivoalto (the present day Rialto) and they began building. 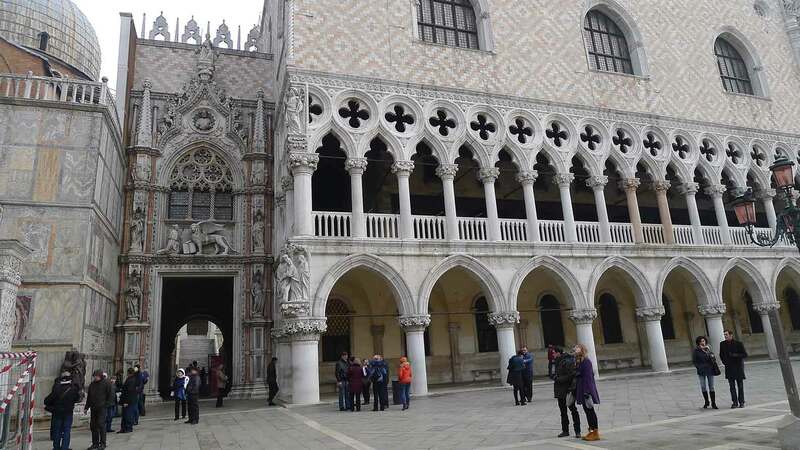 While no trace of this building exists, in the 10th and 11th century the palazzo was fortified, protected by canals, massive corner towers and stables. A fire partially destroyed the palazzo in the 10th century and the Doge Sebastiano Ziani (1172-1178) began reconstruction. By the 14th century a remodeling was required for additional space and the side facing the lagoon was remodeled with the facade we see even today. 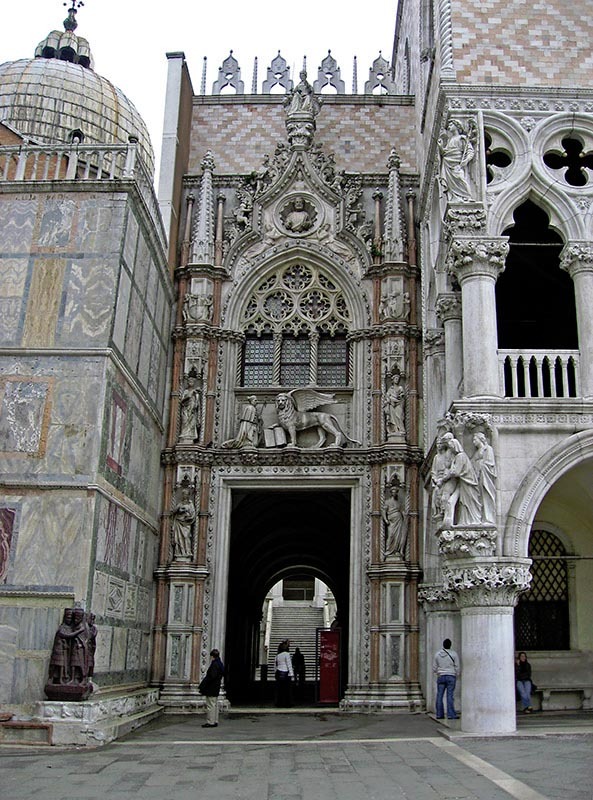 In 1424, Doge Francesco Foscari once again began a remodeling project with the wing which faces Piazza San Marco. 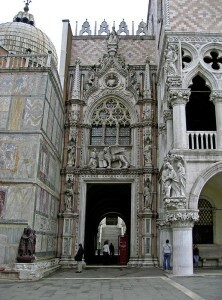 It was this remodeling that produced the Porta della Carta (Giovanni Batolomeo Bon, the architect). And this is where the hooligan chose to climb. If I were the mother or father of this irresponsible, reprehensible, derelict, well I’d hide my head in shame. The fantasy of a video game needs to see just that: fantasy and part of growing up in distinguishing the two. What this young man did is called vandalism and hopefully he is found and punished – shouldn’t be too hard with him plastered all over facebook. 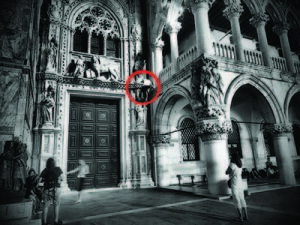 ← Who speaks for Venice? A thing of beauty, surviving the ages to be violated by someone who evidently is ruled by the video games that he plays, and not by logic or common sense. Thank you. It’s a matter of respect. There is literally not even 1 square inch of Venice which is not seeped in history, bought with blood and admired by the world.